Edelweiss (Leontopodium) is flowering plant that is the namesake for the popular tune from the musical Sound of Music and is the national flower of Austria. This plant native to Europe can be found in many rock gardens and is a great addition to any landscape. Edelweiss can be found in the rocky regions of the Swiss Alps as well as in Germany, Austria, Italy, France and even in parts of Asia. It is protected in the wild due to its rarity. The ideal environment for this plant is one with light soil with excellent drainage.It does not thrive in heavy or hard soils. 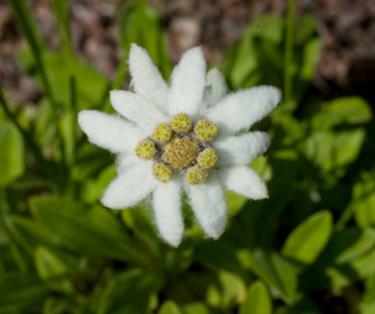 Edelweiss can also be grown in a home rock garden to mimic its natural mountain environment. This hearty plant can withstand winters and will bloom between the months of July to September. Edelweiss is easy to identify. Each bloom of the "noble white" contains up to six small yellow flower centers surrounded by white petals that form a star-like formation. The leaves and flowers of Edelweiss are coated with wooly white hairs. The stalks can grow up to 12 inches tall and eight inches wide. Edelweiss are short lived perennials. Their average span is from two to seven years. After that time, they will vanish from a specific location. To keep growing Edelweiss, divide plants annually or collect seeds. To protect Edelweiss in the winter months, cover it with mulch. 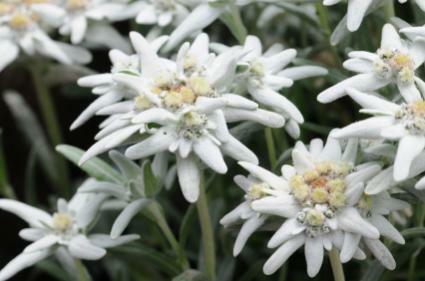 Edelweiss does not need much care; it can survive in sun or shade and only needs to be watered once a week. Since Edelweiss is protected from picking in the wild in many countries, plant this flower at your home to enjoy its lovely blooms. It can easily be grown in rocks or pots and will make for a stunning addition to your garden scape.